In Time to Parent, the bestselling organizational guru takes on the ultimate time-management challenge—parenting, from toddlers to teens—with concrete ways to structure and spend true quality time with your kids. A unique framework with eight quadrants that separates parenting responsibilities into actionable, manageable tasks—for the whole bumpy ride from cradle to college. Simple strategies to stay truly present and focused, whether you’re playing with your kids, enjoying a meal with your significant other, or getting ahead on that big proposal for work. Clever tips to make the most of in-between time—Just 5-15 minutes of your undivided attention has a huge impact on kids. Permission to take personal time without feeling guilty, and the science and case studies that show how important self-care is and how to make time for it. 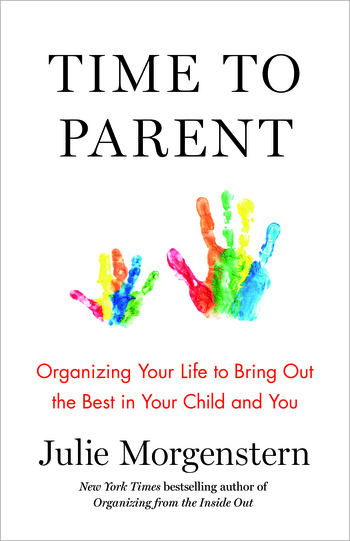 Julie Morgenstern is the author of the New York Times bestsellers Organizing from the Inside Out and Time Management from the Inside Out. She is an internationally renowned organization consultant who has shared her expertise on The Oprah Winfrey Show, The Today Show, and more.